you As many of you might know by now we recently moved and are staying in a rental while waiting for the construction of our home to be completed. If you need to get caught up on the story of our move you can do that here but one of the most important things to me throughout this whole move has been creating a cozy home to make sure my family is comfortable while staying in our rental for the next several months. My husband has recently started a new job so obviously is a bit out of his comfort zone at work currently so when he comes home at the end of a long day it’s been my desire to make sure he’s comfortable. 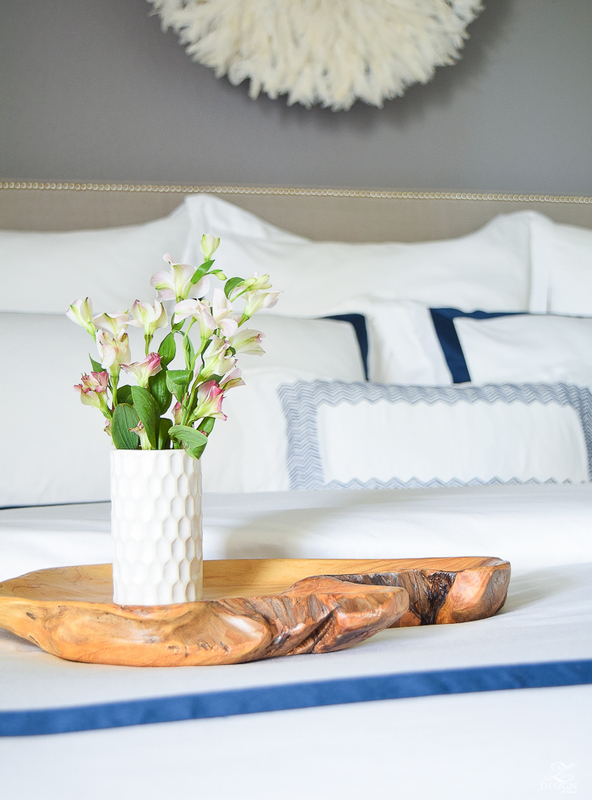 With that said, one of the ways I’m doing this is with great bedding and that’s why I’ve chosen to partner with Boll & Branch for this post to show you how I’m creating a cozy home these days with the perfect bedding. In full disclosure we’ve never had really nice sheets. 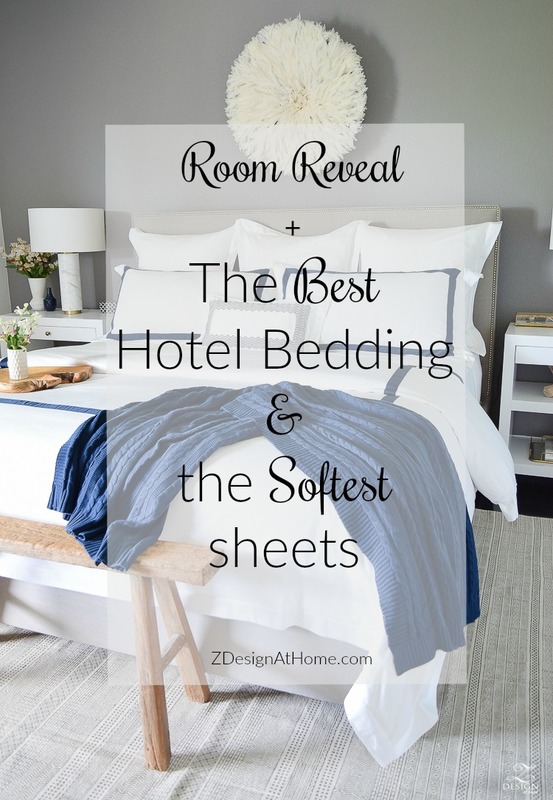 We’ve had decent sheets and decent bedding before but nothing of the caliber that we are sleeping on now with our new Boll & Branch ensemble and I truly can’t wait to share it with you…I’m calling them my big girl sheets! 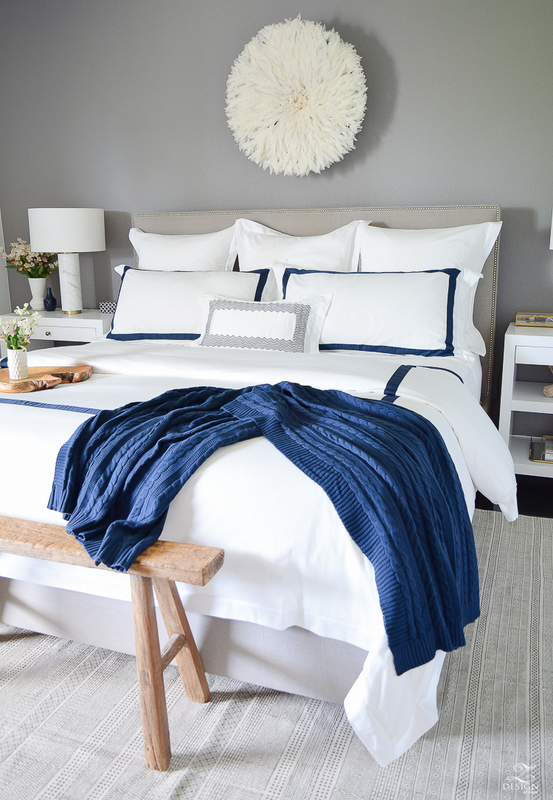 In creating my ensemble I chose to start with the Boll & Branch banded duvet, banded shams, and banded sheet set which provided two things for my bedding look…it gave me that all white base that I always look for in creating a great foundation for my bedding and, with the navy banding, it gave me that pop of color I love to see (the banded collection comes in 5 color options). It also doesn’t hurt that the duvet comes with interior corner-ties and sports envelope-style closure that keeps my duvet securely in place. You probably know by now that I am a stickler for details like this so subsequently this is one of the many things that made using Boll & Branch bedding so easy for me. 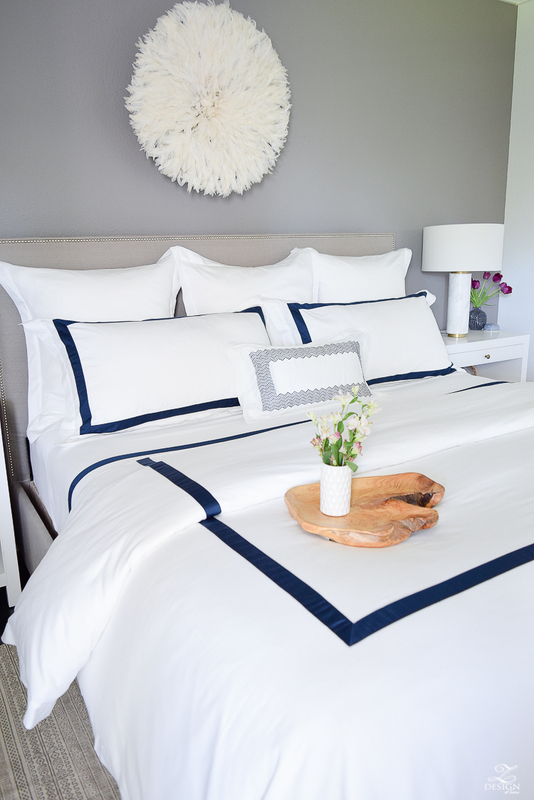 I also chose to use their hemmed sham in white (but it’s available in 5 colors) to begin my pillow styling at the headboard and then I graduated down from there using the banded shams in front of the hemmed shams. I then graduated down again to include one of their hand embroidered lumbar shams to give my bedding ensemble a little personality. 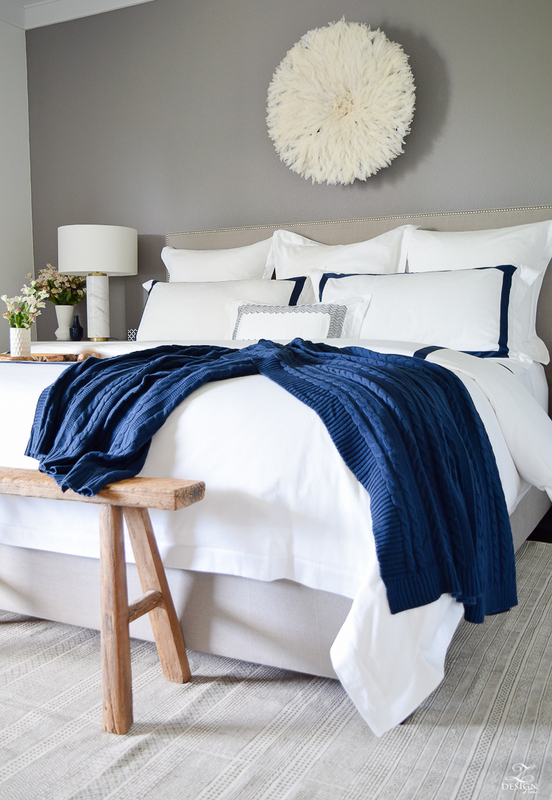 Style Tip: This process of pillow placement allows you to throughly see and visually enjoy each individual pillow sham. 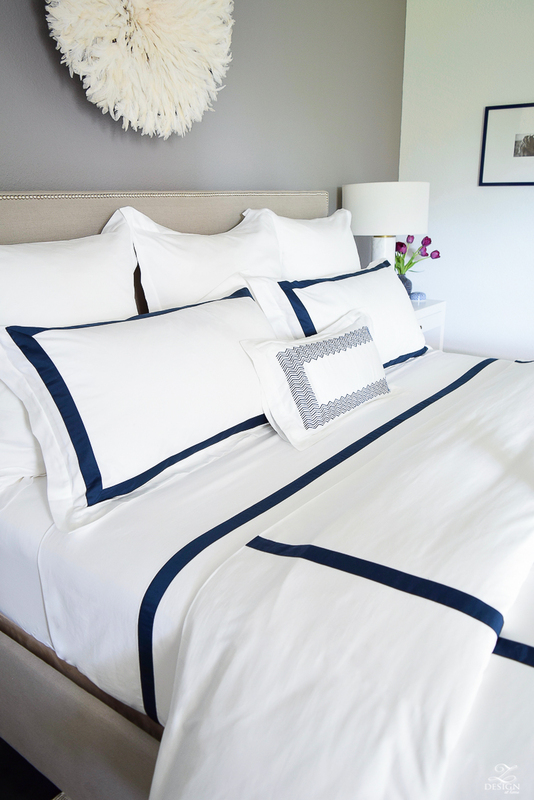 Lastly, I layered the bed with their banded sheets and banded duvet to create beautiful lightweight summer (or anytime) bedding. 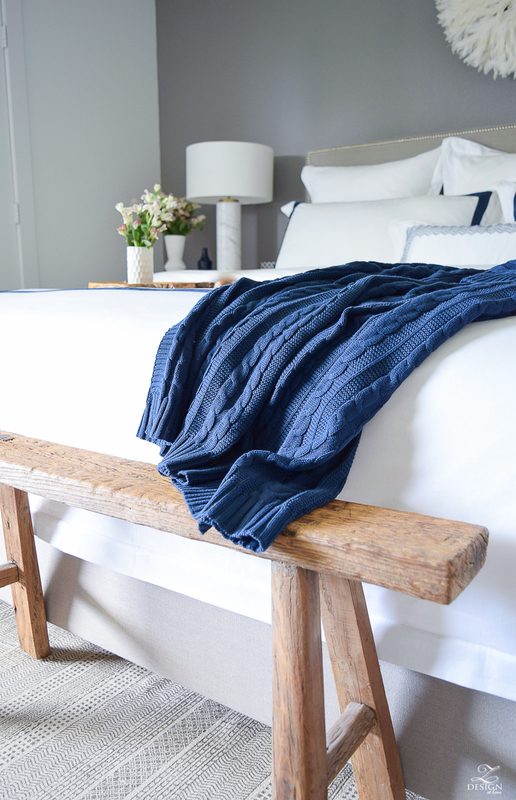 And speaking of adding personality and visual enjoyment…I’ve also chosen to use one of their cable knit throws in navy (this luxurious throw comes in 8 colors though). 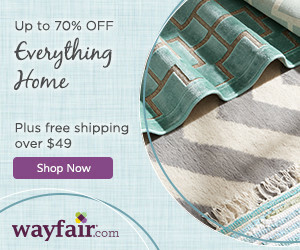 With it’s generous size (50″ x 70″) and rich color it’s the perfect throw for draping over the end of the bed to enhance my bedding look and feel by adding a pop of color and texture when it’s made up, or for snuggling on the couch at the end of a long day. 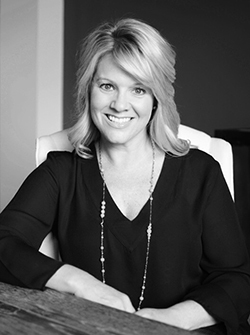 It is also a great medium weight piece so it’s good for all seasons! 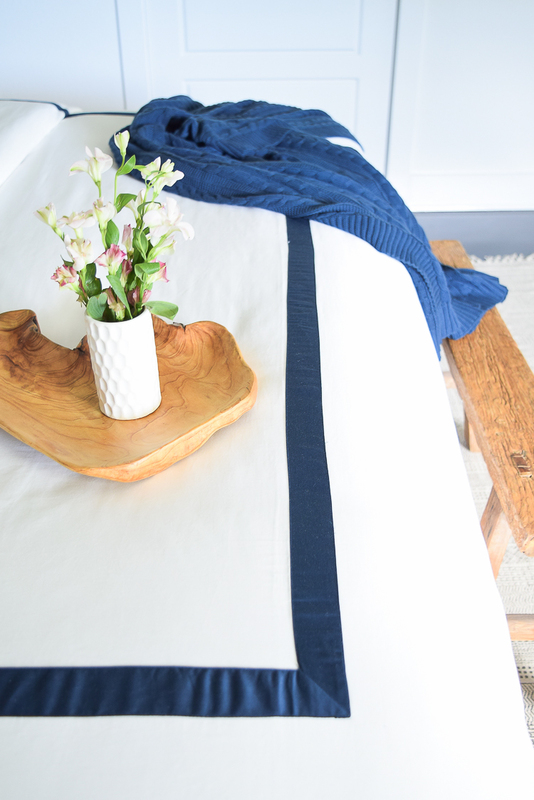 The Boll & Branch sheets are insanely soft and I can tell already that they will get even better with age, and with each wash! There is something so comforting and inviting about sleeping on sheets where so much thought and effort has gone into their careful construction, which certainly makes for an amazing nights sleep! 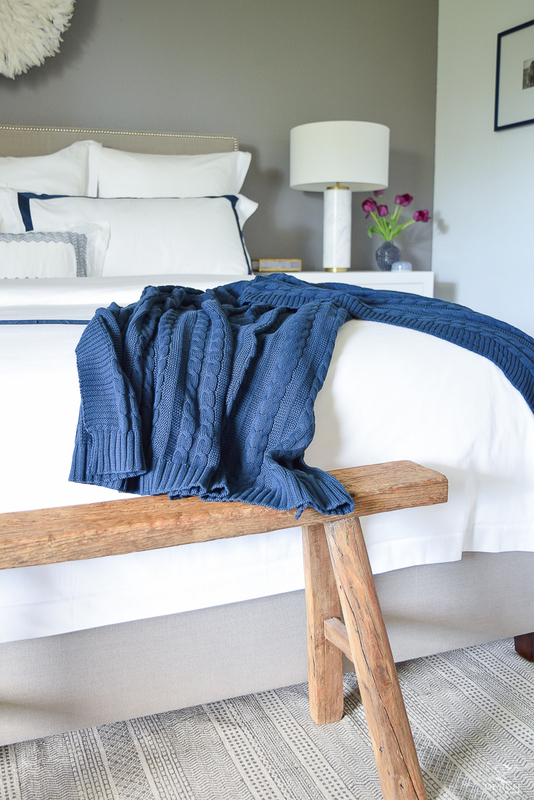 One of the things I love most about Boll & Branch is that their products are all made ethically and responsibly by using Fair Trade Certified Cotton and eco-friendly, non toxic dyes ~ something that is important to me and my family. You can read more about their story here. 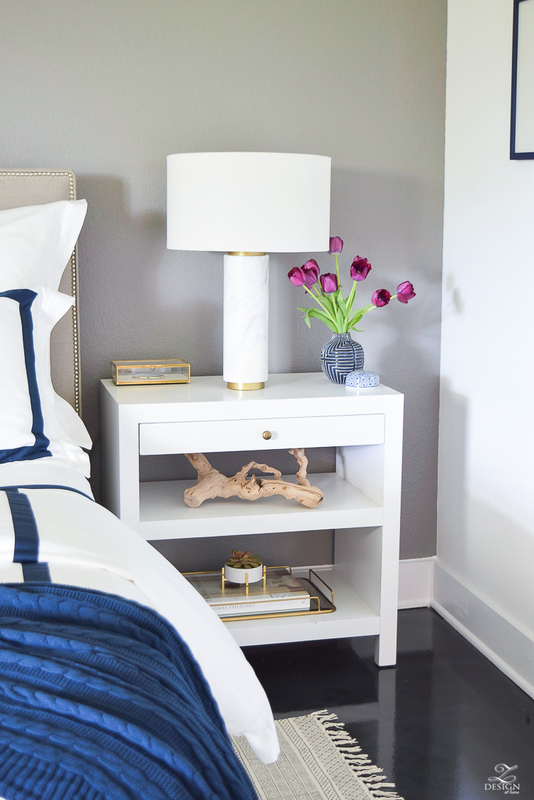 And last but not least, to further keep us comfortable in our temporary abode, I’ve styled the night stands with some of my favorite accessories as reminders of home (see sources at the bottom of this post). The wood and brass accents warm up the room by adding texture and color and add a hint of our personality and design style to the space. You may have noticed also that I used the night stands from our previous guest room which worked better in this space since the wall behind the bed is gray. 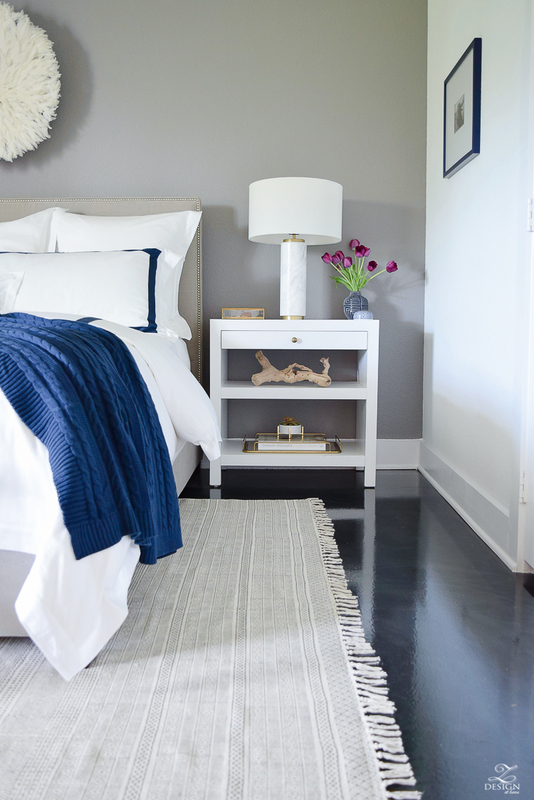 The white against the gray adds interest and a nice contrast to the space. I also love that I can display more accessories on and around my night stand now. I hope you’ve enjoyed the reveal of our bedroom and enjoyed seeing how we are keeping comfortable in our temporary space but I’m not done yet! Come back next week to see what I’ve done with the rest of the space to keep the cozy factor going as I’ll be revealing the other side of the room then! Love this ! So pretty! 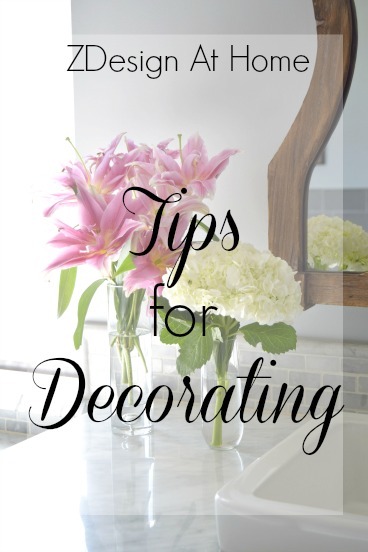 Can you please share the name of the accent wall paint . It’s lovely ! Thank you! You are so sweet! My whole house is white, but I love the accent wall and would like to use this color. Bree, your bed is gorgeous!! I have heard such wonderful things about them; if it is Bree approved, it’s good enough for me! Love that luxurious hotel look! Bree, the bedding is just gorgeous!! Wow! I love the navy banding. And that throw too! Your rental is looking fabulous! You have such a great touch! Bree I want this bedding! It looks so luxurious and I’ve heard amazing things about this company!! It’s just perfect in here, and that navy is fabulous! Gorgeous! That bedding looks very classy and elegant just like the rest of your bedroom! 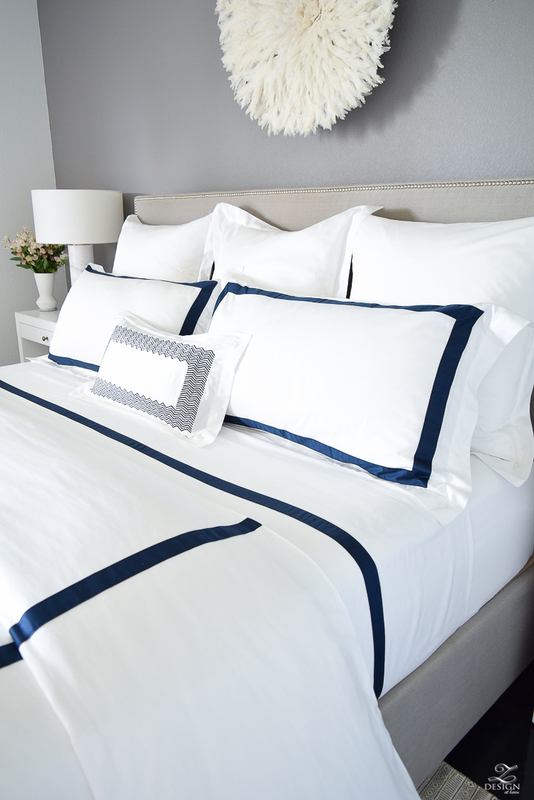 It feels real good to sleep in sheets that feel so luxurious, doesn’t it?! And that beautiful throw is definitely calling my name…!!! It looks great Bree! 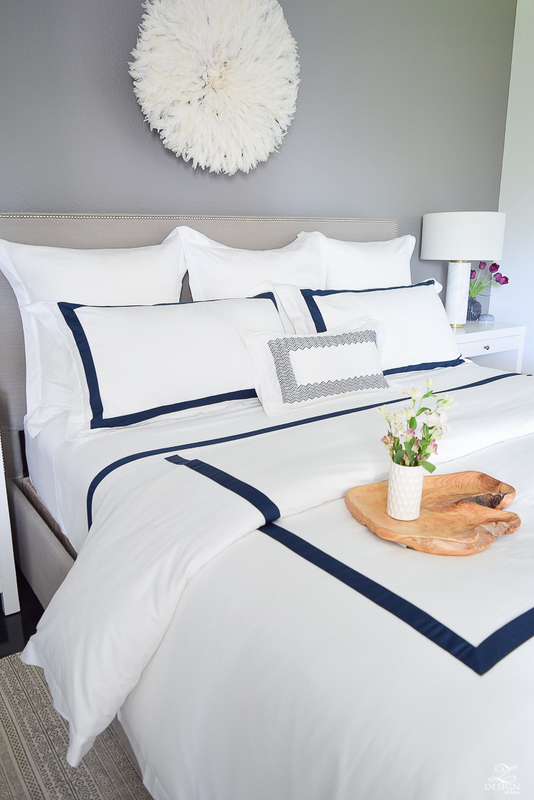 Boll & Branch bedding certainly provides the look and feel of luxury! 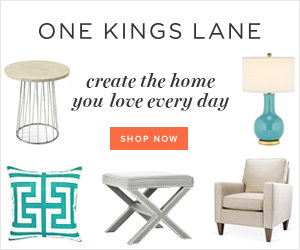 I love it too and I especially love seeing it in your cute rental! So crisp and beautiful, Bree! That bed looks incredibly comfortable! I’m needing “big girl” sheets too! Thank you for introducing me to this brand! Can you give me more information about that gorgeous wooden tray? I’m in love!